Reports are found in Telephone Manager. 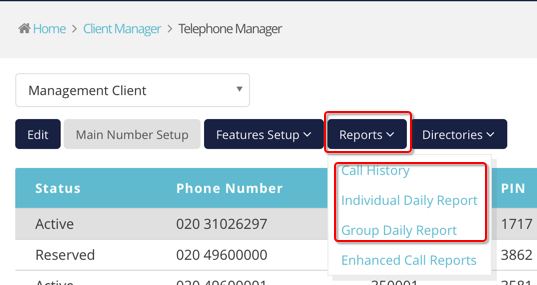 There are three types of call reports available in Connect. Call history - A short report to show the last 20 inbound and outbound calls. Individual daily report - Shows the full call history for a given user, on a given day. Group daily report - Shows multiple numbers across a given date range. All reports are exportable. Just click the 'export' button when the report has been generated. These reports only display calls to and from external numbers. Calls made to and from extensions within the same site will not be shown. A view of all calls, including external calls, use the Enhanced Call Reports. Highlight the number you wish to generate the report for and click Call History. Highlight the number you want to generate reports for and click Individual Daily Report. Select the date and click Submit. 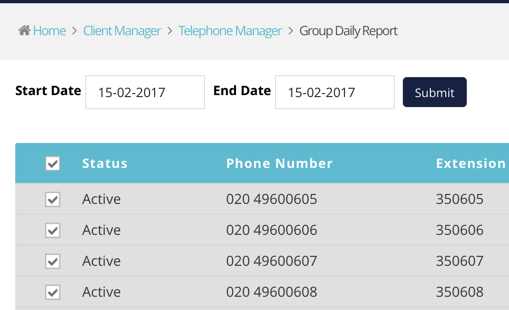 When you click Group Daily Report, Connect automatically selects all active phone numbers within the client. You can un-check numbers that you do not want to be included in the report. Alternatively you can click the All box to select or deselect all numbers. 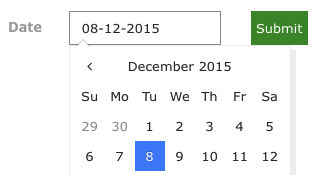 Select the required start date and end date and click Submit.